I'm often frustrated, when reading biographies, by how little a biographer can really know about his or her subject. If everyone who knew them is dead, the evidence is reduced to letters and diaries. Olivier Philipponnat and Patrick Lienhardt, the authors of The Life of Irene Nemirovsky, have, not diaries, but her working notebooks for many of her novels and stories. These notebooks are both enlightening and frustrating, because they give a detailed look at the process by which she conceived and developed her stories. But it then becomes too easy, I think, to leap to conclusions about her own character, beliefs, and choices. Some conclusions, to be sure, beg to be made. There can be no doubt that Nemirovsky wrote about what she knew best, her own people--nouveau riche Russian Jewish emigres in France in the early 20th century, and, later, the French people in general. And it does seem obvious that she poured her feelings about her cold, spiteful, and pathologically vain mother into her fiction. No fewer than three of her novels feature such mothers. 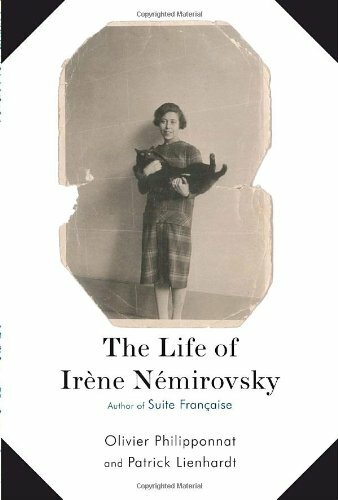 What is known about Irene Nemirovsky is plentiful, and this biography gives an extremely interesting picture of her life, both before and after her family's emigration to France. She was born in 1903 in Kiev, a rather beautiful old Ukrainian city with a large Jewish community. Her father rose from poverty to great wealth as a banker and stock trader. Her mother apparently married him as a "good prospect." Both wanted to forget their humble beginnings in the Kiev ghetto, and lived an affluent lifestyle, spending part of every year in the south of France, speaking French rather than Russian or Yiddish at home. If not for her French governess, Irene would have grown up virtually without love. Her father, Leon Nemirovsky, seems simply to have been remote, and her mother, Fanny, who had an unending succession of lovers, wanted nothing to do with a daughter who was living proof of her age. At the time of the Russian Revolution, after a series of shocking pogroms, Leon moved his family out of Kiev, first to Finland, then Sweden, and finally settled them in France. During her lonely adolescence, Irene discovered the pleasures of literature, particularly modern French writers, devouring Proust, Stendhal, Maupassant. She took a degree in literature and for a few years lived independently from her parents, studying and enjoying the lifestyle of a flapper. Irene began selling comic stories about young flappers to magazines, and eventually met and married Michel Epstein, also the child of Russian Jewish emigres. Her literary career took off in 1929 with the publication of David Golder, whose characters seem to be modeled on her family. For the next ten years or so, she wrote prolifically, her stories and novels serialized in magazines. She bore two daughters who remember her as a loving mother. And finally, the tense months under German occupation, her arrest and deportation, and her death in Auschwitz. This is an amazing and heartbreaking story, but, as with most biographies I read, I'm tantalized by what can't be known about a person from documentary history. What were Irene's real feelings about Jews and her own Jewishness? Her depiction of the Jewish characters in David Golder is brutally unflattering, even stereotypical. But authors write (hopefully) honestly about what they experience, and Irene's family milieu was not a happy one. How much of David Golder was accurate observation, and how much was exaggeration born of hurt? She is quoted in an interview saying that she would have toned the book down had she known what was ahead in the way of Nazi persecution. Would that toning down have represented a more, or less, realistic picture of the Jews of her family? And why, really, did she embrace Catholicism in 1939? No evidence of spiritual feelings is given up to that point in her life. But she knew that in the eyes of the French as much as the Germans, converting would not make her "not a Jew." Was she craving the comfort of religious faith, which she had never known, at an increasingly insecure and frightening time? Was she grasping at straws, hoping to seem less offensive in the eyes of the increasingly anti-Semitic French right-wing press, which she relied on to publish her work? What was the last month of her life like? Obviously we know what she would have gone through at Auschwitz. The camp records show that she was there for about a month before she died of typhus. But I wanted to know what this writer would have produced from that experience, as she produced stories from the other experiences in her life. She left behind no story to tell us about that. Once again our paths cross, Russia, France, Holocaust, history, biography and powerful women who made a difference. These are all the ingredients that capture my attention. Great review and will definitely read about her or better yet, read one of her books...in French. Suprisingly reading French is getting so much easier and a bit addictive! A complete new ok world of books is now accessable! I would never have dreamed I could come this far! I really love her books, and have read almost all that have been translated into English, but there are a lot more that have not. How lucky you are to be able to read them in French; probably they are easier to find where you are. Congratulations--your hard work is paying off! I have that same pleasure with German, although I'm progressing very slowly. Yes, I'm drawn to European/Holocaust history and have read a great deal on the subject, maybe because my forbears were Europeans. Stories of women and ordinary people coping with cataclysmic events are so inspiring to me. It took me two years but I in ally read Suite française in French!